Fancy escaping the stresses and strains of everyday life in your own luxurious hideaway? With a Rural Retreats voucher code you can book yourself in for an amazing holiday without breaking the bank. With a wide range of self catering properties on offer, from country houses to quirky cottages, a Rural Retreats discount code will save you money when you book. Rural Retreats was established to provide self catering holidays with a difference. Believing that everyone deserves the chance to enjoy a relaxing break in beautiful surroundings, the company has carefully sourced and selected a stunning portfolio of properties that represent the very cream of the crop. At Rural Retreats they are committed to ensuring that you enjoy a premium holiday experience from the moment you book to the moment you leave. Their team of experienced staff are always on hand to help you choose the property that’s right for you, and they’ll always take care to make sure that any special requirements are met. The Rural Retreats portfolio of self catering properties features more than 350 stylishly presented houses and cottages, with many of their homes boasting a fascinating history. Looking for the perfect country cottage to enjoy a romantic break for two? They’ve got hundreds to choose from in fantastic locations across the UK and Ireland. Or perhaps you want to enjoy an unforgettable family holiday in a lighthouse keeper’s cottage by the sea? Rural Retreats boast 26 of these beautiful properties where you can really get away from it all. Every Rural Retreats property is lovingly decorated and furnished to an exceptionally high standard. And while several of the properties are hundreds of years old, they have been carefully restored to meet modern standards of quality and comfort. What’s more, each visitor will find everything they need on hand as soon as they arrive, from piles of wood for the cosy woodburners to welcome packs complete with food hampers and bottles of wine. Holidays with Rural Retreats are flexible to meet modern schedules, and at most of their properties you can start your holiday on any day of the week throughout the year. And with an easy-to-use, secure online booking system, getting your holiday organised couldn’t be easier. Want to get booking with Rural Retreats? With a Rural Retreats voucher code you can enjoy fantastic savings on holidays at any one of their gorgeous properties. So whether you want to escape to the Cornish coast or enjoy a holiday deep in the Yorkshire countryside, a Rural Retreats voucher will help you save the pennies. Welcome hampers, wood, linen and more included. Browse our website until you find the Rural Retreats voucher code that suit you, then navigate to their website to begin searching. Enter your desired holiday details and click ‘Search’. Choose a property and click ‘View details’. Choose a date and click ‘Book online now’. Enter your Rural Retreats voucher in the box provided and click ‘Apply voucher code’. If you've enjoyed shopping with Rural Retreats, you might also like to check out more great deals on holiday accommodation at stores like Booking.com and lastminute.com. Or, if those aren’t up your street, you’ll find plenty more deals to browse in our Travel section. Enter your Rural Retreats voucher code in the box provided and click ‘Apply voucher code’. Fill in your requirements and click ‘Place booking’. Enter your payment details and click ‘Submit booking’ to complete. Need to contact the team at Rural Retreats? 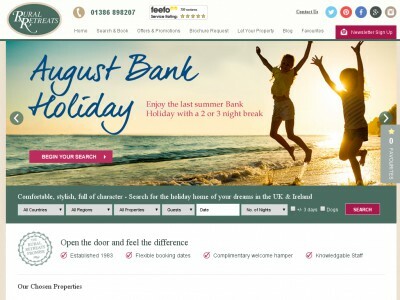 Whether you have a question about your booking, want some expert assistance choosing the right holiday home for you or just want to find out more about how you could make amazing savings with a Rural Retreats discount code, you can contact the Customer Services department by telephoning 01386 897474. Want to find out more about holidays to remember with Rural Retreats? The company maintains a profile across all your favourite social media networks. Follow them for lots of exclusive content including travel planning advice, special offers, competitions and more. You can also use this channel to find out more about saving money with a Rural Retreats voucher. Don’t forget to check them regularly, as you can never be sure when a free Rural Retreats discount code might be waiting for you! Buy now online at www.ruralretreats.co.uk. My husband and I were planning our first weekend away with the kids, and we wanted somewhere really special that wouldn’t blow the budget. Luckily I discovered a Rural Retreats voucher code online. With a Rural Retreats discount code you can get great deals on a wide range of beautiful self catering properties at ruralretreats.co.uk. I used my Rural Retreats voucher to get a fantastic price on three nights in a gorgeous former lighthouse keeper’s cottage by the sea in Cornwall. So why not enjoy your dream holiday for less with a Rural Retreats voucher code?